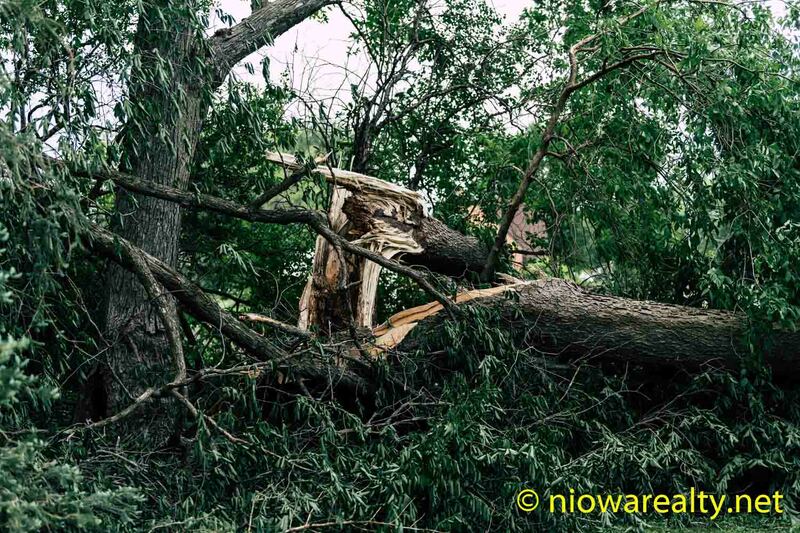 Share the post "Wicked Storm"
The prime topic of conversation all over North Iowa has been the amount of damage done by falling trees and branches from yesterday’s storm, and not to mention all the pieces of siding, roofing, and patio furniture peeled off, picked up, and strewn about. When I went to the Globe Gazette online this morning, I was shocked to find how severe it was in Mason City and Clear Lake. After seeing healthy mature trees over these past several years being pushed over by ever-stronger winds, I’m beginning to not like the idea of tall trees being close to power lines or structures. I don’t even want to mention how much I’ve spent over these last several years to have big trees removed due to storm damage. It kinda makes a person wonder what’s really going on with our weather when considering how old some of those trees were, and certainly how many storms they’d survived over the years. What made me a little sad was having to remove an oak tree that was likely 200 – 300 years old. But, one has to make a judgement call when finding all the more big branches getting twisted by these recent high winds and then falling on, or very near a structure. Just yesterday I saw a likely 100+ year old Hackberry down on the ground after being snapped off at the trunk from those high winds. White Oak and Hackberry trees are supposed to be the most storm resistant. Well, after yesterday, their strength didn’t seem a match against that wind. It looks like many of us will be planting new trees to replace the ones that were destroyed. I spent about a half hour picking up litter that somehow made it to the back of my office, and then back to the front to sweep all the leaves and dirt that was left from the storm. Just thinking about it again, that brown cloud of dust that was blowing Downtown yesterday was akin to an Arizona dust storm. As tight as the front door of my office is, it still managed to blow fine sand inside. I now know what it must feel like to walk out in one of those powdery dust storms after having to cover my eyes from the sting when walking the short distance from my office to my vehicle late yesterday afternoon. I have out-of-town appointments later this week which I’m hopeful will generate the sale of one of my listings. I’m still surprised we haven’t had another offer on 801 West Main in Fertile. It’s a very well kept in-town acreage that has a kitchen to die for, and a man-sized newer steel building which would easily fit four vehicles. Most of all, I love the views of the countryside from its back deck. I’m sure there’ll be a buyer, but as always, we all want them to arrive more sooner than later. On another note, I hope you all have your dehumidifiers plugged-in and running because I can feel the humidity levels rising, and if we get a storm tonight, and another predicted one tomorrow, there’s going to be a whole lot of dampness started in basements—especially if they’re finished. There’s nothing worse than showing a home with a finished basement that smells dampish. I’ve seen more than my share of mold and mildewed basement walls. Keep your chin up and hope we don’t any time soon have another wicked storm the likes of yesterday’s. That one nearly sent me running to the basement for cover. Tonight’s one-liner is: We never really grow up, we only learn how to act in public.